I was able to finish ALL 15 challenges for the PersonalScrapper.com online crop. Go me! Using punches, I made my own flower for the "flower frenzy" challenge. I used Lily Bee papers to scrap Reese's Baptism. For the "Old McDonald"/animal challenge, I had animals in both the paper and photos for this layout. The photos are from the summer of '08 and I'm glad they are finally scrapped. 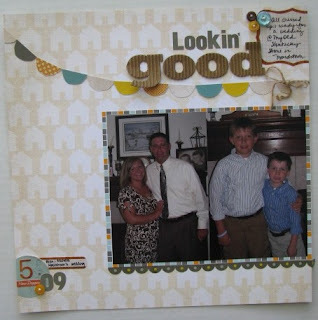 I used a sketch on the tear out sheet from the June '10 issue of Scrapbooks, Etc. Once I saw the Home Front paper line by Studio Calico, I knew that one sheet of paper would be great to cut up and make a banner across a page. Needless to say, I was thrilled to see a "flag/banner challenge" for the crop! I scrapped photos of us dressed up to attend a wedding last May. (Sorry for the crooked photo!) With the crop over, I still have a ton of ideas for layouts. I have so many stories yet to tell! Now, I just need to find the time to scrap! Love the LO's! The flag banner is great! I have yet to try that. I too have so many ideas but am using my time for other things--like enjoying the sunshine. Hmmm . . . I wonder how hard it would be to scrap outside? you always rock the crops! love the banner with the last one!